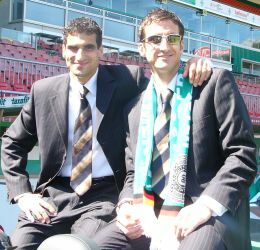 Paul Stalteri played one season with the Toronto Lynx and was seen by a scout from Werder Bremen. 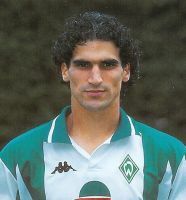 He was bought by Werder Bremen from the Toronto Lynx in November 1997. 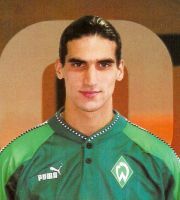 He played with the Werder Bremen reserves from 1997 until 2000. On August 12th 2000 Paul made his debut with the Bundesliga team in the first game of the season against Cottbus. Paul went on to score in this game, making him the first Canadian to score in the Bundesliga. 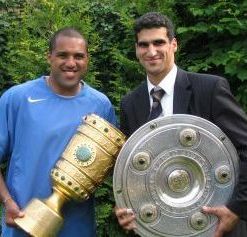 His success continued on in the Bundesliga when Werder Bremen was crowned Bundesliga Champions and German Cup winners in 2003/2004. He is the first Canadian international to win a major league title. 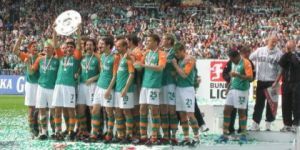 When we consider that Werder Bremen is only the 4th club (in Germany) to win the double in the last 100 years, it makes that feat all the more impressive. 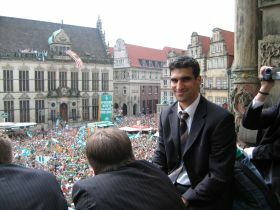 Paul Stalteri made the decision to leave Werder Bremen and joined Tottenham Hotspur FC for the 2005/2006 season. He played 56 games for Tottenham and scored 3 goals. He went on loan to Fulham FC for the second half of the 2007/2008 season to help Fulham avoid relegation. He played a total of 13 games for Fulham and the team were able to avoid relegation. In January 2009, Paul joined Borrussia Mönchengladbach again with the task of helping the team avoid relegation. They were again successful and remained in the Bundesliga. Paul has a total of 55 Premiership appearances. Along with 170 Bundesliga appearances. The Toronto Lynx offered Paul his first professional contract in the summer of 1997. It was the Lynx' first year of operation and Paul was very happy to be a part of the new soccer club in Toronto. 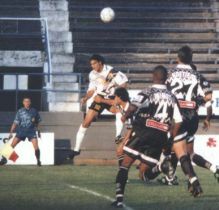 He played mainly an offensive role in the team and scored 7 goals in 16 games. At 20 years old I flew to Bremen for a tryout under coach Wolfgang Sidka. Unfamiliar with Germany, it was an experience filled with many new experiences and emotions. I knew that it might have been my only opportunity to get a contract with a big European team and I had to seize the opportunity. The Toronto Lynx season had ended in early September, making it nearly two months without having touched a soccer ball. It was mostly a mental obstacle to overcome as I came to one of the top-flight clubs in Germany. The first person I met when I landed in Bremen was coincidentally Thomas Schaaf, who at the time was the coach of the reserve team in Bremen. Although he was not the coach of the first team at that time, I am sure that he was leading the campaign for the club to sign me after having watched me for my entire trial. After a successful trial, the club signed me to a one-year contract, with an option for a second year. I was both thrilled and stunned for many reasons. Having learned during my trial that the club usually signs one player in a hundred, I guess I was really lucky to have impressed them. Over the past seven years, having personally witnessed how many players come and go on trials, it really is one of the most difficult challenges a footballer has to get through. So I guess I can say that 1997 was one of the most important and decisive years in my career. At the time I was a person who did not like change, but 1997 taught me to welcome changing circumstances into my life. Early in the year I had already decided to leave Clemson University and sign with the Toronto Lynx. Even though I decided not to return to Clemson, I did not end my academic pursuits. I had my credits transferred from Clemson to York University. In the summer before I was to begin the new academic year, I played in the first year of my professional career with the Toronto Lynx. After having struggled with that decision, and being happy with being back in Canada, I was presented with the opportunity to go on trial in Bremen. It was a decision that was made very quickly and after travelling to London, Ontario to meet the scout, my trial was confirmed and the dates were set. Within 3 ½ weeks from receiving the call, I had left Toronto and signed with Bremen and moved into my new apartment. The next two and a half years were very important. In time, I learned what it took to actually become a successful professional athlete. I learned what type of dedication it took to take that next step in football. During that time period, I learned how to be a more tactical footballer. I played one and a half years with the reserves, when my coach, Thomas Schaaf was promoted to head coach of the first team. At the beginning of 1999 Frank Neubarth was awarded the coaching position with our reserve side and I played an additional year under him. In my years with the reserve team, I was a key member of the team who was consistently in the starting 11. I played mainly in offensive positions. Although it took two and a half seasons of patience, in August of 2000 I finally got the break I had been waiting for. The first day of the season came and Ailton one of our top strikers picked up a minor injury. We ironically became the best of friends, and were roommates each time we stayed in a hotel with the team. We still have a laugh about the fact that the only game he missed due to an injury, from that point until the end of his Bremen career, resulted in my big break. Nevertheless, it was the break I had been waiting for and nothing in the world was going to stop me from taking it. I played upfront that day alongside Claudio Pizarro. The game definitely had a Canadian touch to it. It was also my good friend and Canadian teammate Kevin Mckenna’s debut for his club Energie Cottbus. Both of us went down in the history books as the first Canadians to play in the Bundesliga. Unfortunately the game did not go as well for my buddy as it did for me. We came away the winners, 3-1 and I made a little history again, being the first Canadian to score in the league. Actually, I scored another goal in the game that got called back, thanks to my pal Kevin who fouled a player right before I scored, and the referee for some strange reason did not play the advantage and instead disallowed the goal. Not to worry, till this day Kevin hasn’t lived down the fact that my tally is one goal short! Reflecting back on that day, I lived a dream of any young football player. My goal had been reached and fulfilled, but immediately after the game, my thoughts did not weigh heavy on the game that I had just played, but rather on how much more I wanted to achieve. One game and one goal were definitely not enough for me to consider myself as having a successful career. I enjoyed the experience, the thrill of the game, but that just left me hungry for more! 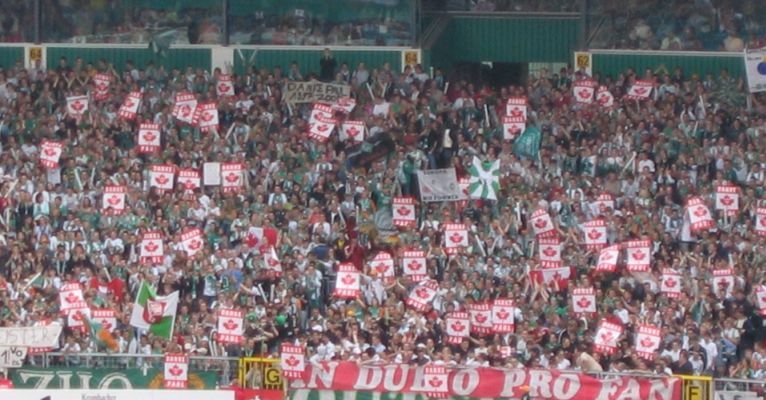 Playing at Werder Bremen has given me many experiences that I as a Canadian would never have had if I had not come to Europe to pursue my football career. To become a professional athlete is difficult and involves a lot of sacrifice, however to win a Championship is something entirely on its own. It is what all professional athletes work to achieve each season. I realize that there are many great athletes that go an entire career without winning a championship title, which is why last year winning both the Bundesliga and the German Cup was so important to me. No matter what or where my career takes me winning those two titles will forever remain amongst the greatest achievements in my career. Throughout the last four seasons our team had many highs and lows. We went on many winning streaks that usually lasted six months or so then either the break in the season came or the season ended. One of the biggest problems our team faced was trying to put together the consistency it needed in order to take us to the top. I believed for many years that we had the quality of players to compete at the highest level and throughout the last few years the team gained the necessary experience to be considered title contenders. I believe their were a few key reasons as to why our team finally were able to put together an entire season without any major slip ups. We had, which I believe to be the best defence in the league, although many experts considered Stuttgart to have the best defence because they had the least number of against goals. But considering the fact that we had an all out attacking team and the fact that in the last two meaningless games of the season we got 9 goals scored against us there leaves no doubt in my mind that we had the best back line in the league. Our striking force was led by my good friend and my on the road roommate for the last four years, Ailton. Believe it or not I told him before the season started that if he concentrated every game and remained focused that he would win the goal scoring title which he has coveted for the past 6 seasons. I told him he could easily score 25 goals. He even beat my expectations which were already high, and scored 28 goals. That was the highest mark anyone has reached in the league for more than 20 years. Let us also not forget the fact that we led in so many games this year in which he was substituted, with sometimes 15, even as much as 30 minutes to go. Had he played every minute, there is no doubt in my mind that he would have reached the 30 goal mark or possibly even higher. When you talk about a winning team there is always a great goal scorer who can score the important goals, 14 times this years Ailton scored the first goal of the game to put us up 1-0, another statistic where he was the league leader. We also had the best combination of midfielders both defensive and offensive. Frank Baumann a more silent, but yet crucial role in stabilizing our midfield. Johan Micoud brought a winning attitude that this team needed. He has the ability to change a game in a split second, he plays with an elegance and a slight arrogance that only the superstars have. He makes the game look so easy at times. But what makes him even more special, is his fighting attitude that most playmakers shy away from, he never pulls out of a tackle and is never shy whether it be in training or a match to sort out another player. Jo is without a doubt the best player I have had the privilege of playing with. It is hard to say who wasn’t important, all the players on the field played a very crucial part in our championship. As in all championship teams, all the pieces fit together perfectly. I played my last home game for Werder Bremen on May 14th against Freiburg. After 8 years in Bremen it was a very emotional goodbye for me. 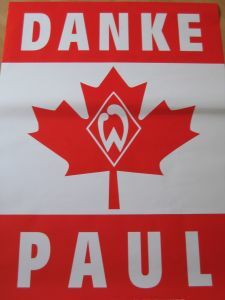 The fans surprised me by having signs saying "Thank you Paul" throughout the stadium. 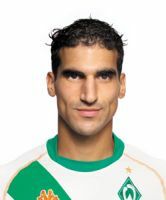 After a memorable 8 year stint with Werder Bremen, Paul Stalteri decided to leave the Bundesliga and joined Tottenham Hotspur FC of the English Premiership in June 2005. Paul made 56 appearances for Tottenham and scored three goals. His first season in 2005-2006 was by far his most successful with Tottenham as he started 33 Premiership matches. He went on loan to Fulham FC from February 1st to June 30th, 2008 and played in the final 13 games of the season for Fulham and helped them to avoid relegation. In December 2008, Paul agreed to cancel his contract with Tottenham by mutual consent.